Thanks for everyone’s help on the recent push with the Hubble CANDELS and GOODS images. I’m happy to say that we’ve just completed the full set, and are working hard on analysis of how the new depths change the morphologies. In the meantime, we’re delighted to announce that we have even more new images on Galaxy Zoo! The new set of images now active are slightly different for us, and so we wanted to explain here what they are and why we want to collect classifications for them. In all phases of Galaxy Zoo so far we have shown you galaxy images which are in colour. The details of how these are created varies depending on which survey the images are from. With the SDSS images, we combine information from three of the five observational filters used by Sloan (g, r, i) to produce a single three-colour image for each galaxy. We’ve talked before in more detail about how those colour images are made. 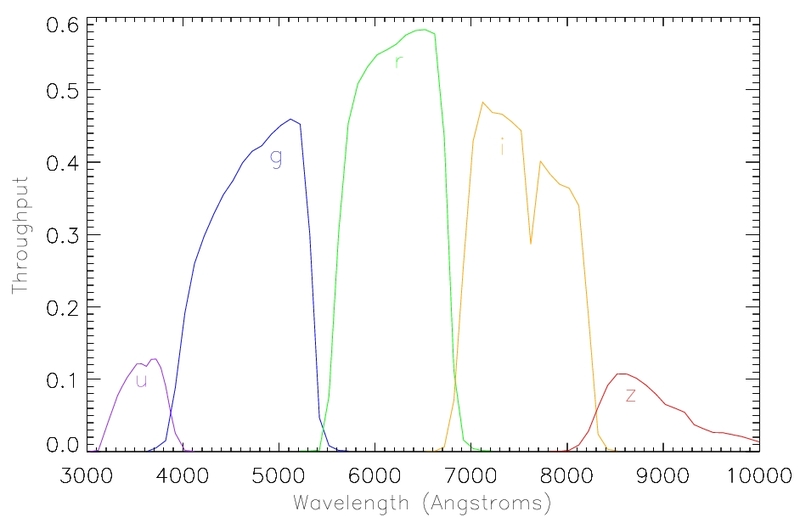 All five Sloan filters and their wavelengths and sensitivity are shown below. You can probably see why we’d pick gri for our standard colour images: these are the most sensitive filters, roughly in the “green”, “red” and “infrared” (or just about) parts of the spectrum. The five SDSS filters and the wavelengths they span. Each of the SDSS filters is designed to observe the galaxy at a different part of the visible (or near visible) spectrum, with the bluest filter (the u-band; just into the UV part of the spectrum) and the reddest the z-band (which is into the infra-red). Different types of stars dominate the light from galaxies in different parts of the spectrum, for example hot massive young stars are very bright in the u-band, while dimmer lower mass stars are redder. Galaxies with older populations of stars will therefore look redder, as the massive blue stars will all have gone supernova already. We are interested in measuring how a galaxy’s classification differs when it’s observed in each of the filters individually. To investigate this specific question, we have put together a selection of SDSS galaxies and instead of showing you a single three-colour image for each, we are showing you separately the original single filter images. We want you to classify them just as normal, and we will use these classifications to quantify how the classification changes from the blue to the red images. Example postage stamp images of the monochromatic single filter images. Astronomers have a good “rule of thumb” for what should happen to galaxy morphology as we move to redder (or bluer) filters, but it’s only ever been measured in very small samples of galaxies. With your help we’ll make a better measurement of this effect, which will be really useful in the interpretation of other trends we observe with galaxy colour. Cool! I’ll bet Ron Buta will be excited … in a recent paper he reported results of an exercise somewhat similar, using Spitzer IR data, but only a few hundred, very local, galaxies (going from memory; I’ll post a link to the paper later). Nitpick: one variant of the original Galaxy Zoo showed us zooites monochrome images, so this isn’t the first time we’ve had black-n-white ones to classify (but I don’t remember if the monochrome images were single band/filter, or just ‘flattened’ tri-band ones). Good memory, Jean. Those were a black-and-white version of the color image, rather than the single-filter images that we’re showing now. So they should look a little different from the first set we did in GZ1 (and of course, this is now with the more detailed classification scheme).